Celebrity Cruises and The Corning Musuem of Glass is proud to present another innovation at sea on Celebrity Solstice and the other Solstice Class ships. When they are done, there will be five cruise ships with live glass blowing demonstrations onboard. That takes traveling glass blowing to a new level. After strolling through the lawn, rest your feet at the Hot Glass Show. There are several demonstrations throughout the day, so don't worry about having the show conflict with some other activity you want to do. Besides the live show, there is a small museum onboard where you can read about the art of glass blowing. However, nothing beats seeing the hot glass show live. It is really a treat to see the show at night since the furnace really stands out with the dark sky. There are also display cases showing the fruits of their labor from previous glass blowing demonstrations. If you are lucky enough, you might even be able to take one of these glass creations home with you. The only way you'll be able to do so is to have your raffle ticket number called in one of the drawings. There is no gift shop onboard that sells the glass creations. It's actually a shame because the artwork is fabulous. We saw several demonstrations, but the most amazing one was at the 11 PM show. The glass blower starts with some molten glass from the furnace and rolls the hot glass over small bits of colored glass that has been put on the table. After that, it's back to the furnace to melt the glass that was added. This process continues layer after layer until a large amount of glass has been built up. The glass is shaped using various instruments and eventually scored so that it can be removed from the rod that has been holding it. It is hard to explain what happens next, so I've attached a video clip showing the finale. We've seen glass blowing before, but never at this scale or under a unique setting like on a cruise ship. Celebrity and CMOG have certainly brought a new level of entertainment to the cruising public. Everyone really enjoyed the show - especially the children. On our cruise, there was one child that must have seen every show, because they even called him by name. Also see my previous post From Grass to Glass. The day you've been waiting for is finally here. You arrive at the Miami International Airport and meet the Carnival Cruise Line representative who directs you to a waiting shuttle bus for the ride to the Port of Miami. The excitement builds; you are just minutes away from boarding the ship for a fabulous cruise to South America. At the door to the terminal, the guard checks your Carnival Fun Pass and photo identification and directs you to the check-in line. There aren't many people ahead of you, so this shouldn't take long you think. Finally, it's your turn. You present your paperwork and passport to the agent who begins checking you in. It won't be long now. The port agent is very jovial as he starts processing your embarkation. All of a sudden, his face becomes serious and he asks you to wait a minute. He goes over and talks to someone else and both of them return. The second agent, his supervisor, asks if you have a visa stamp for Brazil. You tell him no, that you didn't know you needed one and in fact, you weren't planning on disembarking the ship in Brazil so why do I need one. An enternity passes, and he says, "I'm sorry, without the Brazillian visa stamp in your passport, you are denied boarding". You plead with him, again saying that you don't plan to leave the ship. That doesn't matter he says, and explains that they are not allowed to board any passengers without the visa stamp. He says how sorry he is but there is nothing he can do. You ask if you can't purchase the visa when you get to Brazil and he tells you that is not possible. Walking away from the counter, you shake your head, you can't believe what just happened. This can't be possible. Unfortunatley, this is not a dream; it did just happen to you and in fact several more passengers recently suffered the same fate at the Port of Miami. That story has been in the trade press and prompted me to write this post. Hopefully, you are reading this before heading to Miami for a South America voyage and it's not too late for you. I've used Brazil for this story, because that was the circumstances around this recent incident. There are other countries that require a visa of passengers entering that country. Even if you do not plan to leave the ship when it arrives for a daylong stop in that country, you will not be permitted to board the ship if you have not obtained a visa for that country. Next time you book a cruise, determine in advance whether you will need a particular visa for a country on the cruiseship’s itinerary. If one such country does require a visa, and does not honor a "group visa" issued by the cruise line (like St. Petersburg, Russia does), then be sure to obtain a visa for the visa-requiring country. How do you know if one of the countries on your itinerary requries a visa? That's pretty simple to find out. Consult the Country Specific Information on the U.S. Department of State website. While you are on their website, also pay attention to the Latest Travel Alerts and Warnings. The direct link for Brazil Information shows some other information which you also need to check. Besides providing the information about the visa requirments, there is information about potential vaccinations you may be required to obtain for entry. In particular, if you have traveled to certain countries within the last 90 days, you'll be required to get a Yellow Fever vaccination. For example, after visting the Galapagos in Ecuador, I would have needed to get that vaccination to go to Brazil. You'll want to check Traveler's Health on the Centers for Disease Control website. Check for any warnings and also for information about health precautions and vaccinations. If vaccinations are required, discuss with your family doctor or a doctor that specializes in infectious diseases. Obviously you'll not have to worry about water supply or food while on the cruise ship, but when you are in port, or if you extend your stay, you'll want to be aware of health safety. We had no problems in Quito before or after our cruise to Galapagos. We drank bottled water and not the tap water as was suggested. Following a few simple tips can make the difference between a good or bad cruise vacation. Ideally the cruise line and / or the travel agent that books your trip will supply you with information such as visa requirements and vaccinations. If they don't volunteer that information, you can ask them for advice, however the responsibility rests with you to check for yourself. Often information changes, and it is advisable to get the latest information directly from the country's website. I hope this warning prevents you from standing forelorn at an embarkation port, denied boarding because you didn't meet necessary requirments. People cruise for many reasons. One or more of the following might be among your list of reasons for a cruise vacation. Heading up the list are: getting away from your daily routine, seeing new lands, meeting new people, celebrating a special occasion, and relaxing and pampering yourself. This column focuses on the last reason in this short list of reasons. Celebrity Solstice has taken pampering and relaxation to a new level. For those of you that have entered a spa and never wanted to leave, consider booking in the new AquaSpa Class stateroom. These cabins are on the same deck as the spa's relaxation room. Select spa elements such as mood lighting, music and ambient sound, and a special 5-head Hangsgrohe showerhead, are incoporated into the stateroom. In addition you'll have specialized access to spa amenities, such as the Persian Garden, the Spa Conceirge, and you'll have assigned seating in the Blu resataurant. AquaClass stateroom and Suite guests enjoy complimentary use of the Persian Garden. 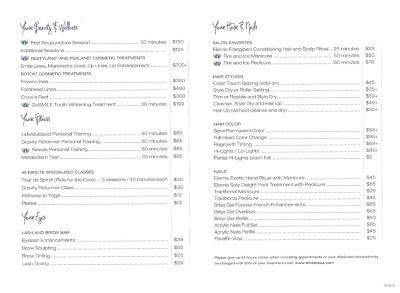 I've included the AquaSpa menu here so that you can see the wide range of unique spa treatments on Solstice Class ships. My favorite treatment is the Aroma Stone Therapy Massage. If you've never tried this, make sure you attend the AquaSpa open house when you embark the ship. My husband tried one of the signature massages, the Thai Herbal Poultice Massage. He said it was very relaxing. With this treatment, you still have a full body massage but the therapist also uses pressure and pounding with the herbed filled poultice in addition to her hands. This is the first ship that we've seen this particular treatment. 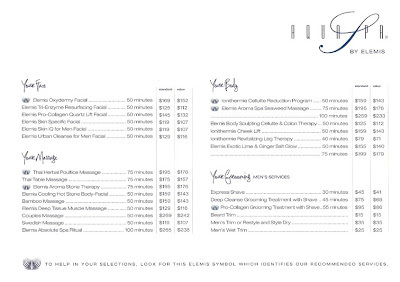 Click on the menu above to see the full range of spa services. Men and women have a wide selection of beauty, wellness and fitness options to choose from. If you want to look your best for dinner some night, you can make an appointment in the salon. Whether you are interested in organized fitness classes, individualized personal training, or simply following your usual routine while onboard the ship, you'll be able to do so in the beautiful surroundings while looking out at the ocean. I'll talk about the Solarium in another post. That rounds out the AquaSpa offerings for those of you that want to relax, pamper yourself, or maintain your fitness routine. These pictures were taken onboard Celebrity Solstice. Do these pictures look strange to you? That is real grass - not artificial grass. Celebrity Cruises and parent company Royal Caribbean International have always been known for innovation, but you might be thinking someone lost their marbles when they thought this one up. Celebrity Solstice is the first cruise ship, among any line, to have grass growing on the top deck. When we were onboard Celebrity Solstice, it had just made its way across the Atlantic and was about to start sailing out of Fort Lauderdale, FL. One of the first things we did when we boarded the ship was to check out the lawn and the Lawn Club. A section of the grass was roped off and the sign said "Lawn is Resting". The reason for that was that growing grass while crossing the Atlantic with blowing salt water and windy conditions proved to be a lot harder than one might imagine. The grass was showing wear already and the ship hadn't even had its maiden voyage. Steps were being taken to nurse the grass to health. We played a game of croquet with fellow passengers. It had been a long time since we had played and the activity staff did a great job teaching us the rules and keeping score. Despite the ringer amongst us, we all had a great time. Later this year the second Solstice Class ship, Equinox, will begin sailing. She too will have a Lawn Club. I don't ever want to hear people say there's nothing to do onboard a ship. With the introduction of lawn games, there should be something for everyone. Will that be With or Without Air? There is no right or wrong answer to this question. You do want to make an informed decision, however. When clients call me to plan a cruise, one of the first questions I ask them is if this is cruise-only or cruise-with-air. More often than not, they aren't sure which way to go. There are several factors that come into play when deciding whether to do cruise-only or purchase airfare in addition to the cruise. Let's take a closer look at this. It is possible to sail from 23 U.S. ports. Depending on where you live, it might be easier and less expensive to drive to the homeport instead of flying there. Is this a round-trip cruise? If the cruise departs and retuns to the same port, and you can drive to that port easily, that still might be your first choice. Flying is also an option if the port isn't in driving distance. Since this is a round-trip cruise, you'll be able to make round-trip air accomodations either through the cruise line or on your own. Is this a repositioning cruise? If the cruise is a repositioning cruise (often also known as a Transatlantic depending on destination) that may complicate things a bit. If the embarkation port is your homeport, it still might make sense to drive to the port. You'll just have to make arrangements to pick up your car upon return from the port of disembarkation. If the embarkation port is not your homeport, you'll have to fly to that destination. Depending on the final destination port of the cruise, you may or may not have to fly home from there. Either way, you are now no longer talking about round-trip airfare. Is there a cruise line incentive? Especially in this ecomony, the cruise line may offer an incentive for booking select cruises. European cruises are good examples of when you might see some incentive. The incentive could be reduced air, free air, or upgraded accomodations with air purchase. You'll want to compute the complete cost of your cruise with or without applying the incentive. Let's face it, you want the best value for your money, but you may also want convenience. So the question about which air is cheaper (cruise line or independent arrangements) may not be so clear cut after all. 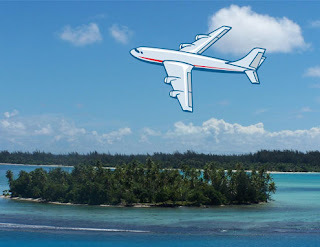 One thing you need to keep in mind is that the cruise line is arranging flights as a convenience to you and bears no responsibility if the air carrier doesn't deliver on its implied promise to get you to your destination on time. You'll want to check the cruise contract carefully and understand your rights and coverages. Travel insurance is your best bet if you want peace of mind. Another thing to keep in mind is that cruise lines typically purchase bulk seating as one-way tickets so that they can use them as needed. That will often impact the price of the ticket and make independent booking the cheaper price. Do you want full control of your arrangements? This may come as a shock to you, but you can still have control of airline and departure times even when booking your flights through the cruise line. Custom air is available from most cruise lines and may be subject to additional fees, but may be the best of both worlds for you. If you have premier frequent flier status with an airline, you might want to factor that into your decision process. Depending on the length of your cruise, and whether there are formal nights, you might be bringing extra baggage which could have cost implications. You'll want to take advantage of any extra baggage allowances your status allows you. Are transfers from airport to pier included? A hidden cost that you may overlook is the price to get to/from the airport/pier. Often the cruise line air will include transfers. You also need to determine the cost of transfers if you make alternative arrangements. In some destinations, like Europe, transfers can be rather expensive if you need to arrange them on your own. Are you confused - what to do? As you can see, there are many factors that come into play when deciding the best transportation for your cruise. I've listed the majority of the considerations here but there may be others depending on the cruise and ports involved. It is best to seek advice when making this decision. Your cruise specialist will be familiar with the transportation options for your cruise vacation and offer advice. The decision will still be up to you. One approach that you might consider is to book the cruise-with-air initially and then do your homework to see if alternate arrangements are better for you. Don't wait until the last minute to book your flights or your ship may sail without you. While on our pre-inaugural cruise on Celebrity Solstice, one of the first experiences we had was dining in the Oceanview Café. We were immediately struck by the eye appeal of both the dining area and the serving area. Especially appealing was the serving area which was very spacious. The color scheme included beiges, and other light colors, yellow, gold, and blue lighting. Signs overhead clearly marked each serving station. Passengers collected a plate from one of the many serving islands and filled their plates as they made their way easily from station to station. There were duplicates of some stations so that if the line was long at one of them, you could simply go to another one and not have any wait. The stations included a beverage station, salad bar, fromagerie (cheese selections), pasta kitchen, pizzeria, BBQ, chefs corner, the carvery, the bakery, and desserts. At each station, the food was arranged meticulously - nothing was out of place. We've seen many buffets on ships and this was the most efficient and elegant setting that we've ever seen. It goes without saying that the quality of food was very good also. Celebrity has definitely raised the bar on fast food. We enjoyed all of our breakfasts in Oceanview as well as our lunches. If you didn't want to eat inside, you could go out on deck and enjoy the ocean views in an open setting. Don't miss this treasure while onboard a Celebrity Solstice class ship. Celebrity Cruises announced this week that the construction of Celebrity Equinox is ahead of schedule and a Soft-Launch in the Norwegian Fjords is being added to the 2009 cruise schedule. The Equinox is a sister ship of Celebrity Solstice which debuted last November. Since that time it has received rave reviews from everyone that has had the good fortune of sailing on her (including yours truly). You may recall that there was some controversy last year when pre-inaugural cruises were added to the cruise schedule. Passengers that were booked on the maiden voyage felt like they were cheated from being the first to set sail on the Solstice. This time, Celebrity Cruises is extending a special offer to passengers that are already booked on the ship's maiden voyage of August 8. Celebrity has invited them to combine their 10-night “Best of Europe” cruise with the 8-night soft launch, for a spectacular 18-night voyage on the new ship. Celebrity is offering those guests an onboard credit of $200 per stateroom or $300 per suite if they add the 8-night cruise to their reservation. The 8-night cruise through the Norwegian Fjords features visits to Stavanger, Flam, Geiranger, and Oslo, Norway. The 10-night maiden voyage, which will include an inaugural gift and commemorative activities, will visit Paris/Normandy (via Le Havre) and Cherbourg, France; Vigo, Cartagena and Barcelona, Spain; Lisbon, Portugal, and Gibraltar, UK, ending in Rome (via Civitavecchia), Italy. 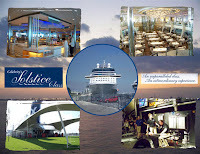 We had the good fortune of sailing on the Solstice last year and enjoyed the half-acre Lawn Club with real grass, The Corning Museum of Glass glassblowing show, the various new dining venues, entertainment, and the modern decor of the ship. We have also had the good fortune of sailing through the Norwegian Fjords and the European ports that will be visited on this 18-night voyage. According to Celebrity, reservations are now being accepted for the 8-night cruise which will depart on July 31st. If you are looking for something special in the July/August timeframe, I would definitely put this cruise at the top of your list for consideration. I've written about the Solstice in past posts and will cover it again in the near future. As always, I'd be happy to help you plan your cruise and answer any questions you might have. Birthdays, Anniversaries, Weddings, Honeymoons, Graduations are some of the special occasions in our lives. If you are like most people, you surround yourself with family and friends to celebrate. Sometimes you are surprised when family and friends get together and have a party or recognize your special day in some other fashion. When you look back on your life, those occasions may stand out more than others. Perhaps you went with family and friends to a fancy restaurant and had a nice dinner to celebrate the event. The restaurant staff may have brought you a special treat and sung to you to recognize the occasion and help to make it a special day for you. Celebrating your special day while on a cruise vacation is a great way to make your occasion memorable. Your cruise specialist can assist you in planning a special recognition during the cruise. Most cruise lines can provide a special treat with your dinner and many have decorations for your cabin. Gifts can be delivered to your cabin. The wait staff at dinner will even sing to you, in serveral different languages at once, if you'd like. Couples celebrating special anniversaries, such as Silver or Golden, can be recognized by the Captain of the vessel with a special certificate and perhaps a party. You don't have to celebrate alone if you don't want to - you can book several cabins for family and friends and have your own private celebration. There are many options for celebrating special occasions. 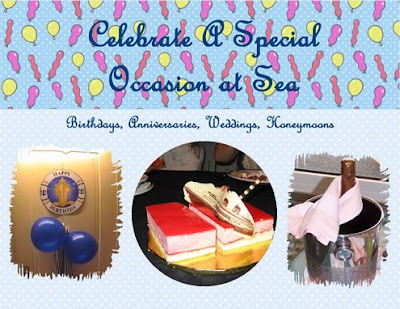 We have had many celebrations at sea over the years and have really enjoyed them. It's hard to believe that February is almost behind us. Before you know it, spring will be here and soon after that, summertime. Spring and summer can't come fast enough for me as I bundle up and head out in the snow one more time. The snow had melted, but it has returned once again. So, I let my mind wander to cruises that we went on the past few years. Summertime conjures up images of sandy beaches, swimming in the lake, children building sand castles, and people enjoying other water sports. Of course, that could also be wintertime if you were lucky enough to escape to the Caribbean or other warm destinations. I'd like to paint a non-traditional picture of summertime for you. My picture includes castles, royal palaces with guards protecting their gates, cathedrals, people walking along busy avenues, and strolling through well-groomed parks. These are among the sights you can see in Europe. Cruising to Europe, especially this year, is an exceptional value. With the exchange rate lower than it has been in years you'll be able to make purchases ashore, should you wish to do some shopping, at better pricing than you could for a long time. Your ship serves as your floating resort allowing you to visit many destinations easily while keeping expenses for food, lodging, and entertainment to a minimum cost. The cruise lines have many ships deployed in Europe for the Summer of 2009. Every day we see several offers for fantastic savings on European cruises. These include 2-For-1 savings, free airfare, onboard credits, and even free shore excursions. With all these choices, you'll be able to find an itinerary that matches your interests with your budget. But you'll have to act quickly before these deals expire or the ships fill up. Having cruised to Europe several times, I can assure you that this will be a memorable experience should you take advantage of these offers. 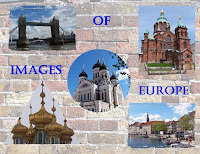 I've written about some of our European cruises in past posts. These should give you some ideas, or you can check-out my website. 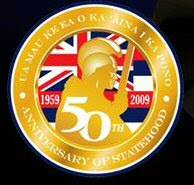 On August 13, 2008, members of Hawaii's 50th Anniversary of Statehood Commission announced a comprehensive plan to commemorate Hawai‘i’s golden anniversary of statehood, with a year-long series of events and activities. 50 is a landmark anniversary to celebrate, and Hawaiians plan to do it in style. There's plenty of time to join in the festivities which will be held around the state. A cruise is an excellent way to see the Islands of Aloha. Hawai‘i’s Governor Lingle spoke about the Commission's plans saying “In emphasizing education and passing on of Hawai‘i’s rich history to a new generation of leaders, I believe that we are giving this milestone the weight and attention it deserves". "The plan’s varied components will provide residents and visitors of all ages with opportunities to reflect on how statehood has contributed to the Hawai‘i of today and the direction we are headed as the youngest and most ethnically and culturally diverse state in America,” the Governor added. The road to statehood began on May 18, 1959 when Congress passed a bill proposing that the Territory of Hawaii become the 50th state of the union. President Dwight D. Eisenhower signed the bill making it official on August 21, 1959. To commemorate the day in 1959 that the U.S. Congress passed the bill which allowed Hawai‘i to be admitted as a state, the Commission will host a public event at the State Capitol on March 18, 2009, which will include various family activities from noon until 1:30 p.m. in the Rotunda and Capitol grounds. A special joint session of the Hawai‘i State Legislature has also been requested. In addition, a Memorial Day commemorative event and an arrival ceremony for the first commissioned submarine named for the State of Hawai‘i, the USS Hawai‘i, are being planned for summer 2009 to recognize the invaluable contributions made by the military to Hawai‘i both before and after statehoodCoordinated by neighbor island representatives to the Commission and their local planning committees, each county will host several island-specific events to commemorate statehood. I'll take a closer look at the Islands of Aloha in future columns. It's the morning of January 3, 2009, and the temperature in Anchorage, Alaska ranged from a low of -14.4 °F to a high temperature of -4.7 °F. That did not stop the native Alaskans from celebrating a historic event - the 50th Anniversary of Statehood. The celebration actually began the night before with the 50th Anniversary Gala at the new Dena’ina Convention Center. National and International dignitaries attended this historic event for a sit-down dinner and entertainment which included dance, symphony, and opera. January 3rd saw the downtown area of Anchorage taken over for a huge birthday bash. A procession of Alaska’s diverse people kicked it off with performances at three separate venues. And, of course, there was a fireworks show. 50 is a landmark birthday to celebrate, and Alaskans plan to do it in style. Alaska’s 50th birthday will be celebrated all year long so there's plenty of time to join in the festivities which will be held around the state. We were in Alaska in September, 2008, for our National Conference. Celebrity Cruises was our host for our 8 Night Alaska Northbound cruise. You can see the Alaska 50 banner on the lightpost in Juneau. The cruising season in Alaska is from May - September. The cruises usually book up fast, but there are still cabins available. I always recommend extending your stay in Alaska to include some time on land. A cruisetour is the best way to really experience Alaska if you can spare the time. 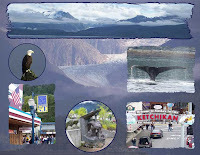 The road to statehood began on May 28, 1958 when the U.S. House of Representatives passed a bill proposing that Alaska become the 49th state of the union. The bill was passed by the Senate in June of that year. President Dwight D. Eisenhower signed the bill making it official on January 3, 1959. In a future column I'll describe our most recent Alaska cruise on Celebrity Mercury. "Taking pictures is making memories. Capture little pieces of time, making them yours making them mine." (words taken from a Disney song sung by Minnie Mouse). In this column I'll explore several ways of making memories which can last well beyond your return home from the cruise vacation. Photography is probably the most popular way to capture little pieces of time. In the age of digital photography, it is very easy for you to become a photo journalist using your cruise vacation as the subject matter. My husband has always had a fascination with how the mind works. How is it that if just the right "trigger" is present, you will remember all about some past event? Photos make excellent "triggers" that unlock memories about past cruises and experiences. Those of you that have been reading my column for awhile know that my husband and I take lots of pictures on our cruises (He takes more than I do). I don't always get time to write about our cruise just after we return. The photos we take help us to remember the various excursions we took. 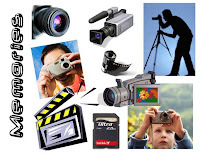 Video clips with sound are even better, but we don't take as many videos as we do photos. Taking photos in the digital age is much easier than in the days of film. It's a lot easier to travel with several memory cards than it was to travel with several rolls of film. It's not uncommon for us to have thousands of digital images from a cruise vacation. We had to be more selective when you'd only get 36 pictures on a roll of film. Not to mention the fact you needed different film depending on the weather conditions. Perhaps that's a topic for another column. There are many ways to store the photographs that you have taken. In our mind, we don't want to keep the memories to ourselves, so we share them. One of the easiest methods is to put photos in albums. Another is to share them online with one of the many services. Again, I could devote an entire column to this topic alone, so that's about all I'll say for now. 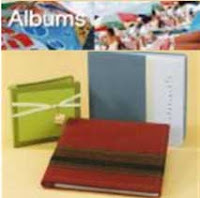 Taking photo albums a step futher, scrapbooking is a method for preserving personal and family history in the form of photographs, printed media, and memorabilia contained in decorated albums, or scrapbooks. This has become a very popular hobby recently and even the cruise lines are finally starting to capitalize on this new market. When we were on Celebrity Solstice for the pre-inaugural, we purchased a scrapbook album and the accompanying scrapbook page kit which consisted of pages, stickers, and other complimentary decorations. These materials could only be purchased onboard. Royal Caribbean was the first cruise line to recognize that passengers had an interest in scrapbooking, and they added scrapbook workshops to their daily activities. 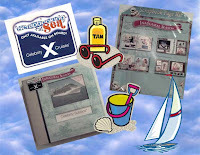 You supplied the photos (ideally purchased onboard) and they supplied paper and all the equipment to make your first scrapbook page for your trip. Other cruise lines have also started offering similar programs. Scrapbooking takes some pre-planning. Since I knew that I'd create a scrapbook for our Galapagos trip, I collected some items to be incorporated in the pages. Items that are good for this purpose include boarding passes, room keys, admission tickets, and stickers. You'll want to keep the daily planners that are delivered to your cabin each night. They will help you remember various activities that you did as well as provide destination information which will help you when doing the journaling part of the scrapbook page. Warning: Scrapbooking is addicting and can be expensive! When we were in Alaska, many of the souvenir shops had scrapbooking supplies such as pages and stickers which were specific to the port of call. Your local hobby or arts and crafts store typically has materials to help you get started. They may even offer classes if you don't know where to begin. There is a wealth of information on the web as well as several scrapbook suppliers. If you think you'll want to create a scrapbook for your cruise, take some pictures, purchase some onboard and at the excurisons that offer professional photos, and collect some memorabelia to embelish your album. We can talk more about scrapbooking in another column if there is interest. Not everyone likes to take photographs while on vacation. That doesn't mean you can't make memories to take home with you. Souvenir shops and the ship have a selection of post cards which capture the highlights of the destination. 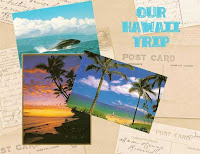 Post cards can be used to supplement your own pictures and memorabilia. You can put them in albums or use them in your scrapbook pages. They can be mailed home to add a postmark or packed in your luggage. Another advantage to post cards is that they capture a moment in time that perhaps you weren't able to see personally. For example, if your ship sails before nightfall, consider adding a post card that depicts the city at night. While you might have experienced a sunset, it might not have been as intense as one of the ones captured on a post card. "Our moments of inspiration are not lost though we have no particular poem to show for them; for those experiences have left an indelible impression, and we are ever and anon reminded of them. " Henry David Thoreau (1817-1862) American naturalist, poet and philosopher.